In 1918, as the Russian Empire was roiled by the First World War and the Soviet Revolution, Lithuania took advantage of central government weakness to fight and win its independence. Lithuania was an independent member of the League of Nations until the start of WW II. In 1940, as a result of the Molotov-Ribbentrop Pact between Nazi Germany and the Soviet Union, the U.S.S.R. brutally annexed Lithuania, imprisoning and killing thousands and deporting tens of thousands to Siberia. 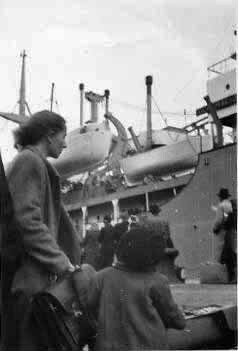 As a result, tens of thousands fled Lithuanian and ended up in displaced persons camps in Germany starting in summer 1944. Several thousand of those Lithuanian refugees later immigrated to the United States under the U.S. Displaced Persons Act of 1948. And several dozen of these immigrants, called “DPs” or “Dypukai,” arrived in Springfield under the sponsorship of first-wave relatives who had arrived during the coal-mining boom. 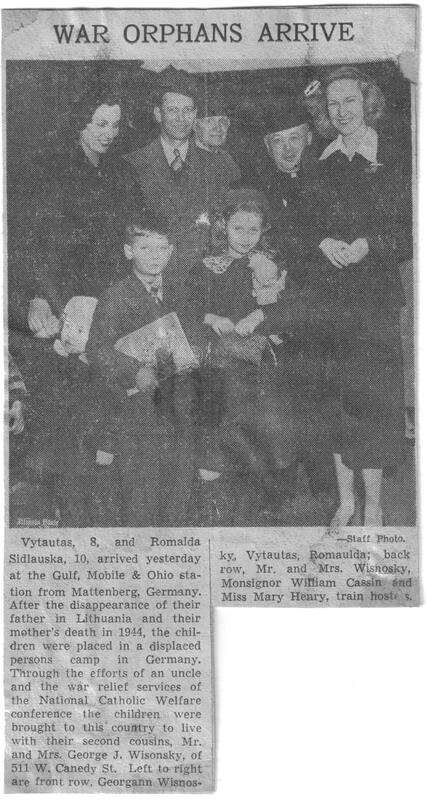 Among this second wave of traumatized refugee immigrants were Lithuanian war orphans Vytautas and Romualda Sidlauskas. You can read about the arrival of these two children in Springfield, probably in 1948 or ’49, in the local newspaper clipping below. The Paulionis family also was sponsored by a branch of the Urbanckases, their distant relatives, my great aunt Mary Yamont (Marija Jomantiene) sponsored my father after spotting his name among lists of refugees in German DP camps that were printed in a Lithuanian newspaper. This may be how many displaced relatives were located. Many first-wave immigrants and their beneficial organizations also were involved in re-settling DPs to whom they had no relation and are to be commended forever for their Lithuanian patriotism and humanitarianism. The so-called “Second Wave” immigrants or DPs were often displaced professionals and officials of the formerly independent Lithuanian state who felt a moral imperative to preserve Lithuanian identity and culture abroad while their homeland was wiped from the map. Most had to accept manual labor and factory positions once in the U.S. due to language challenges and foreign degrees that were not recognized here, so never worked as professionals again. The freedoms Lithuanians enjoyed in the U.S. allowed them to express national and cultural aspirations and religious beliefs that were ruthlessly repressed in their Soviet-dominated home country. But assimilation, over the generations, remained a force to be reckoned with.